Birding Tips & Tricks — Hey Porkchop! Bird watching is definitely an exciting hobby. I think sometimes it's easy to assume it's a lot of boring walking around not seeing much of anything but it's totally not like that at all! There have been times when I've had to remind myself, CALM DOWN. THE BIRDS CAN SEE YOUR MUPPET ARMS FLAILING ABOUT! Also: birds are very much alive. and moving. constantly. and fast. Can you see the hawk flying in the very top photo?! One of my favorite birding tips that Sibley succinctly puts is: Look at the bird. When I see a bird I don't recognize, I watch it as long as it's physically possible rather than glance, then look at a field guide. Why? Because in the time it takes for me to find a page in a book or scroll through my phone, the bird can leave. And I want to gather as much information with my eyes as possible before this happens! Often I'll tell Chop what I'm seeing so we both can talk about identifying marks- birding with someone else is great for this. So for example: gray face. bright yellow throat. dark breast. yellow rump. Then, when I feel like I've committed key aspects of the bird to memory or it's flown off, I'll use Merlin to get an idea what it might be. Merlin has 400 of the most common North American birds. Sometimes what we see might be be a common bird, but immature or in a different version of it's colors. Once I know for sure what it is, in this example it's a Yellow Rumped Warbler, if it's a brand new bird I've never seen before, I'll add it to my life list using LifeBirds. It's so easy to get caught up in seeing a new bird (I'll admit, new birds make me squeal) and want to id it INSTANTLY. But the best thing you can do is just to simply watch and mentally catalog it. If Merlin can't help, it's good to have a little time watching the bird because you'll start to notice certain body shapes or characteristics to help determine what it is. For example, wrens! I love wrens! But they are a LBB (little brown bird) I've learned to recognize them because their little tails are almost always up in the air above their bodies, they definitely have a unique body shape! (don't we all ;)) The more you look at birds, the more you'll begin to associate certain characteristics to certain birds. 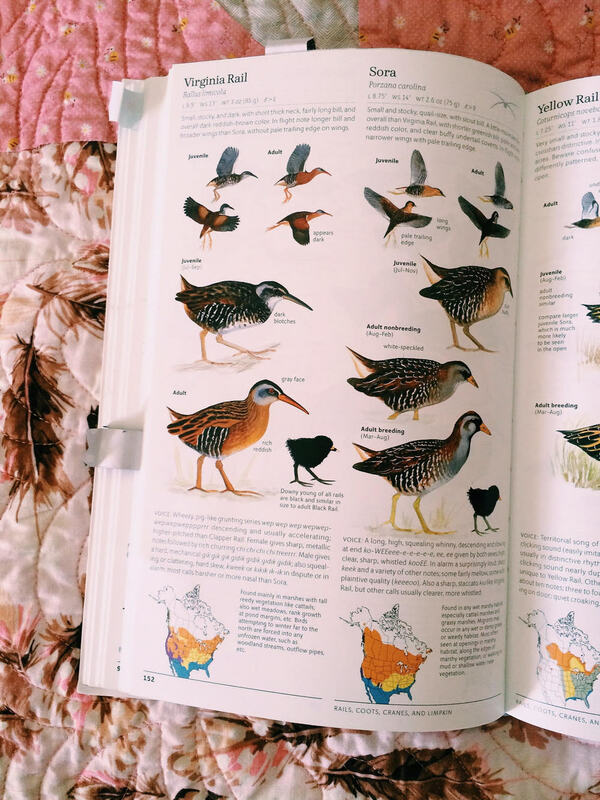 By looking at the book, you can get ideas of what kind of terrain you are in or around, what will visit that area and where in the area you can potentially find the bird you want to see. The more specific you can get, the better. For example, I'm obsessed with seeing a Rail. I think they are really fascinating birds. I know through looking at Sibley that I'll never be able to see a King Rail because they don't live even remotely close to us. But I could see a Virginia Rail! In the guide you'll see a map of the US, purple means it's year round where we live! So I know I'm not having super crazy unrealistic expectations by wanting to see it. Next I look at the habitat. It likes marshes with tall reedy vegetation, wet meadows, rank growth at pond margins. That means I'm not going to see it in the middle of my neighborhood. If I do, it's lost and we have a bigger problem going on. ;) However, I know that when I visit my local refuge, I should keep an eye out along the bottom of the patches of tule in shallow water because that is a location it would like to be! It's obviously not a guarantee that I'll see one but it'll give me a good idea where to look. I've been trying to see one for over a year now and while I haven't see one, I have seen a Sora! I would never have seen it if I wasn't looking for the Rail. So keep your eyes open, even if you don't get to see what your specifically looking for, you never know what you will see! I know some of you are reading this post and thinking "I live in a suburb/city/etc, there are no cool birds!" One Saturday morning this winter Chop & I got up and decided to walk to Starbucks. We live on a busy street with lots of big truck traffic. As we were walking, we noticed a tree with a ton of birds on it. It was absolutely FILLED with Cedar Waxwings! They travel in flocks and they were all in this one tree. They migrate through in the winter, by the time we walked back a few hours later, they were completely gone. And I walked back to the area where we saw them for nine days in a row around the same time as the original sighting...I never saw them again! It was a chance sighting and that's how bird watching (and let's be honest- life!) works. Sometimes you'll see the most fantastic things in your own backyard! This past weekend we had the privilege to watch a Barn Owl sleep in a tree cavity. I have no doubt if the sun wasn't hitting her how it was, we would never have seen her! Always be looking and be aware of what is around you- I think you'll be surprised! When we were in Texas one of my favorite things was telling the ranch owner how excited I was to see a cardinal and how I hadn't seen one and IT HAD TO HAPPEN. He looked at me kind of funny and said "oh those funny little red birds, sure, we got those!" And that afternoon he dropped us off at a elevated stand and a few minutes later...ALL THE CARDINALS. Talking about birds, even folks who aren't into them, can lead to surprising results. Visiting Texas was actually a fantastic birding trip. I got to see so many birds that I normally wouldn't get a chance to see. One morning while Chop was hunting, the ranch cat (Lucky!) and I went for a walk. I kept seeing this little red blur and knew it was too small to be a cardinal but I kept watching it. Eventually it landed at the very top of a tree. I was having a hard time with my old binoculars that morning but instead took a few photos and waited for Chop to get back. It was a Vermilion Fly Catcher! And each day we saw him hanging out in the top of the same tree. My new favorite thing is to keep all my birding supplies (and spare epipens!) in a dedicated bag by the front door. This way it's always ready to go, I just pop in my Filofax and a Klean Kanteen of water and I'm good! I was previously using a Topo Designs Daypack for all things outdoors but I switched to a Project Bag from Chicken Boots specifically just for birding. I like to carry some sort of knitting with me and this bag keeps my yarn separate from my field guide and binoculars! It's also narrower so it fits down near my feet in the car nicer. As of right now, I have 166 birds on my life list. I've only been seriously keeping track the past year and I'm really picky about what I include. I've always wanted to see a Crested Cara Cara and I saw one flying but it was just a silhouette. I don't include it on my list because while I did see it, I don't feel like I got the chance to really SEE it. PS: If you aren't into bird watching but like quilting, I saw this on Kerry's instagram feed (so cute!) and there is always this epic quilt with bird blocks to sew!